This is my second piece of homework for a vignette collage. Claudine's comment for my last piece was fantastic - she said - "A great job on vignette!! I love the way you layered the images and great use of negative space." So I know what a vignette collage is and how to do one and this is another. I chose the image to go with the backing poster advertising a display of toys and dolls. The other pieces fit in with the theme quite nicely. Again there is only one focal image and all the elements (bar the butterfly) are grouped together. I added the butterfly in the red colour to balance up the ticket. None of the elements bleed off the canvas, although this time I have added a sentiment/title. I have changed the height of the vignette, which is lower on the canvas but it still 'floats'. I submitted this yesterday and left a message saying - "My second piece for Vignette. The collage elements aren't all together, I wanted the butterfly to balance the colour with the ticket and the vignette is not floating in the middle. Does this count?" Claudine's reply was "This looks great! It doesn't have to be perfectly centred to be a vignette! I think you did a great job!" Woo hoo, that is soooo encouraging. Thanks Claudine. Only one more week of the course left, I shall definitely look for more. This one was held at 'Big Picture Classes'. You might want to take a look. Everything is done on-line with galleries for downloading pictures, email and a chat forum. Love your homework Brenda, it's brilliant, and a great big tick from the teacher too, that's great. I AM indeed going to Newbury Artstamps but liaising four people's preferences .... depends on whether one of the friends is staying on Sunday night ..... will let you know as soon as I know. All going in my party are craftbubblers - it would be fab to meet wouldn't it? Lovely card Brenda. I see you are branching out.....so glad you are enjoying your class! 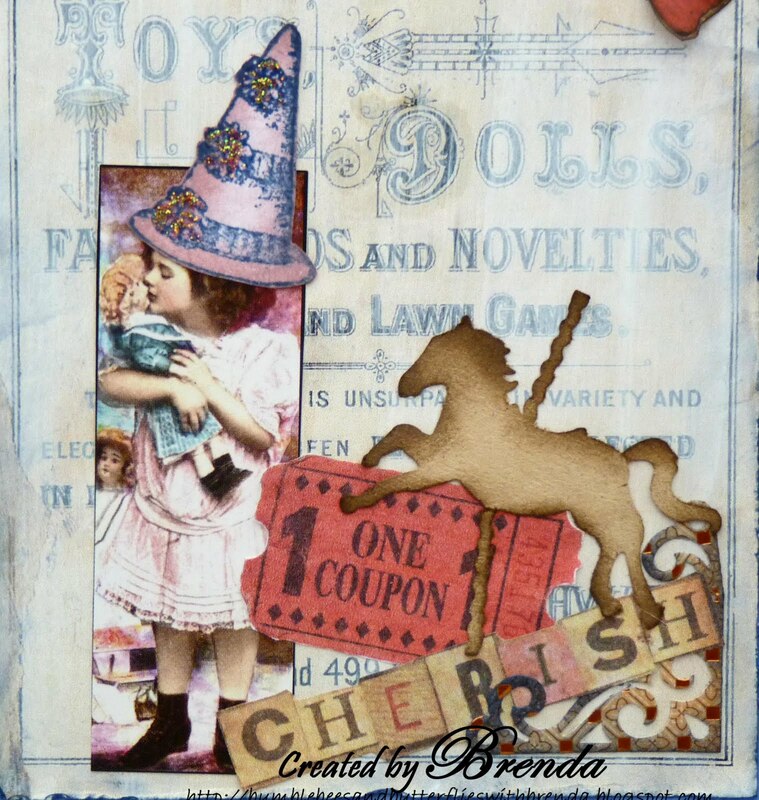 Brenda this is fab! You are fast becoming an 'artist' Tim better watch out he has a rival! 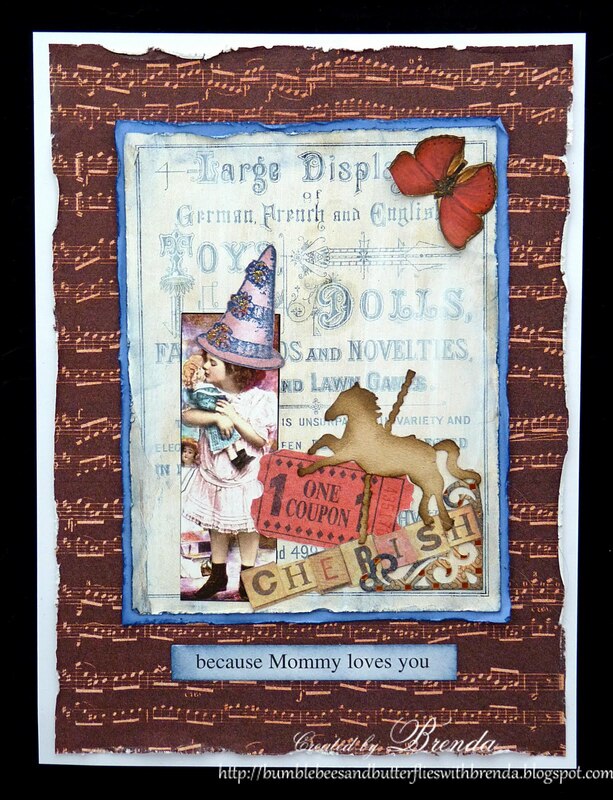 Amazing collage card.Love all details . If you want to meet up then let me know - if you want to post your cellphone number on my blog then I promise not to publish it! Love the collage and all the little details - gorgeous!! Two lovely collages Brenda, I think you have a "natural eye" for placement and know when it looks right, the class sounds great fun . This is absolutely gorgeous, my friend!! I use that background alot and love it...but oh my gosh--I adore what you have created here--beautiful!!! Wonderful collage with great elements.